Division of Fire crew along a perimeter line of the Garden Creek Fire. 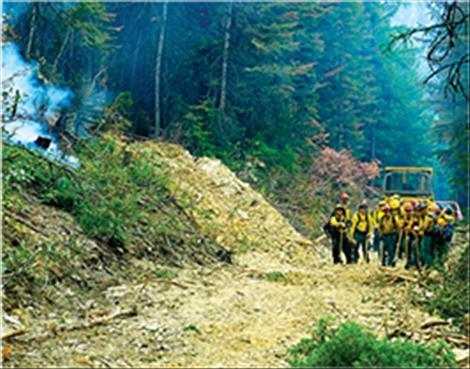 HOT SPRINGS – According to Confederated Salish and Kootenai Tribes Division of Fire officials, the Garden Creek Fire which grew to more than 2,000 acres is 50 percent contained and moved from a Type 3 to a Type 4 incident over the weekend. The July 27 lightning sparked wildfire burning two miles northwest of Hot Springs, has seen little to moderate fire activity as fire crews focus on securing control lines and working on mop-up activities. On Saturday, lighting caused a 1/10 of an acre fire along the river near Moeise. It was quickly contained and is on patrol status.